On a recent trip from Tarapoto to Chiclayo, I decided to test out my newly acquired travel pillow: the TravelRest. Unlike smaller travel pillows, the TravelRest is designed to support the whole of your upper body. The top of the pillow provides a stable resting place for your head, while the remainder sits across or alongside your torso. A cord lets you attach the top of the pillow to your headrest or seatback, or you can wear it around you like a guitar. My 14-hour bus journey to Chiclayo seemed like a good time to road test my new piece of travel kit. I went with Civa, one of the midrange Peruvian bus companies, so, while reasonably comfortable, the bus didn’t have all the added extras of top-enders like Cruz del Sur. Inflation: Inflating the TravelRest was easy, with just a few puffs needed. The valve is a bit fiddly at first, but it functions well once you’re used to it. Positioning: I started by attaching the TravelRest to the back of my seat using the cord. I was a bit dismayed at first – the curvature of the headrest meant that the cord itself kept on digging in to the back of my neck. Not a good start, but easily resolved. When worn guitar strap style, the cord issue disappears. 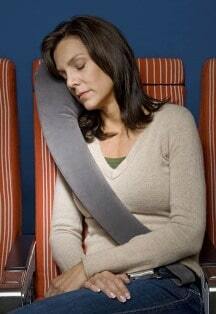 Stability: Even without the cord holding the pillow in place, the TravelRest is reasonably stable. I tested it in an aisle seat and a window seat, and it functioned well in both. Support: The Tarapoto to Chiclayo road has its fair share of twists and turns, something that can cause your head to swing annoyingly from side to side. This is where the TravelRest really excels. You can put the full weight of your head and upper body onto the pillow without it giving way, keeping you from rolling across your seat as the bus swings through corners. It’s also easy to switch the pillow from side to side. Storage: When deflated, the TravelRest rolls up into a neat little package no larger than a single sandal. It’s hard to fault the TravelRest, especially when it retails for less than US$27. I’ve never used any kind of travel pillow during my backpacking adventures, but I’ll definitely be sticking the TravelRest in my pack for long-distance bus rides. Many backpackers in South America take overnight buses to cut down on the cost of hostels and hotels – if you fall into that category, I’d definitely recommend the TravelRest. I’m a traveler and sometimes I felt pain on my back when I’m riding on for a long period. That’s why, I want to try this TravelRest Travel Pillow if its really effective and efficient when I’m going to use. Really excited. Hopefully it will help with the back pain. You might find yourself shifting the position of the TravelRest a few times, but it’s pretty comfortable once you find a good position.